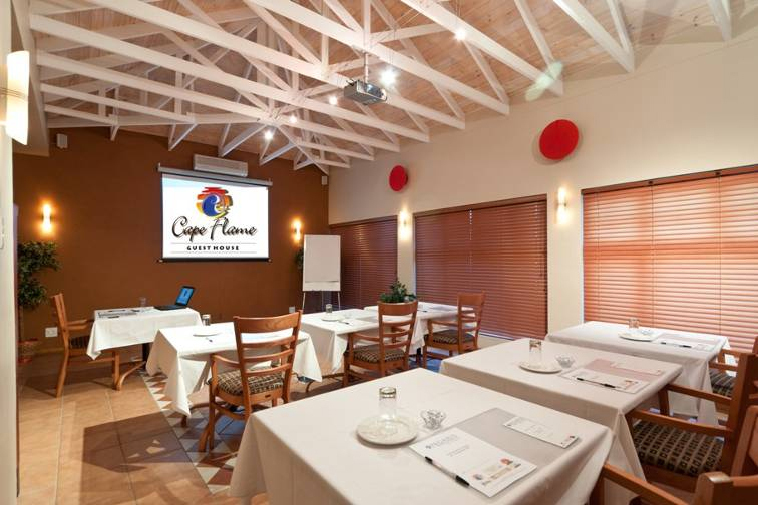 At Cape Flame, we are one of the top Conference & Function Venue choices in Port Elizabeth. The stylish dining room doubles up as a 25 seater Conference Venue with a digital projector, screen, surround sound, TV & DVD player. Packages are based on the numbers of delegates and specific requirements and are geared towards meeting the individual and unique requirements of each corporate client. Mid-morning break: Assorted teas/freshly brewed coffee and a choice of a homemade muffins or scones with jams and cheese. Lunch: A two course selection menu with a fresh garden/herb salad. FULL DAY EXECUTIVE PACKAGE Arrival: Assorted teas/freshly brewed coffee, fruit juice with mini pastries. Mid Morning Break: Assorted teas/freshly brewed coffee, fruit juice, selection of whole wheat rolls or mini sandwiches. Afternoon Break: Assorted of teas/freshly brewed coffee, with freshly baked cake squares or homemade biscuits to finish off the day.